By Jordan Heller, Huffington Post. Above photo: One of Cleveland’s neighborhoods that Evergreen Cooperative Corp. aims to help revitalize. Michael McElroy for Huffington Post. “We’re creating pathways into the economy for people who’ve been shut out,” says Cleveland’s Evergreen Cooperative. Cleveland ― The last time Tymika Thomas’ name appeared in newsprint was in connection with an elaborate 2012 robbery in the Cleveland suburb of Wickliffe in which Thomas and two accomplices stole numerous handguns and more than $30,000 in cash from a bookie. Thomas, who knew the victim and was well aware that he kept a large amount of money in his home, took the man out for a night on the town while her partners broke into his house. Thomas and the man returned to find two armed robbers wearing ski masks. They absconded with the man’s possessions and took Thomas as a hostage. The kidnapping was bogus, of course, meant to disabuse the victim of any suspicion that Thomas was involved. We are in the Evergreen Cooperative Laundry, located in Cleveland’s Collinwood neighborhood on the east side of the city, a community that has long suffered from disinvestment. 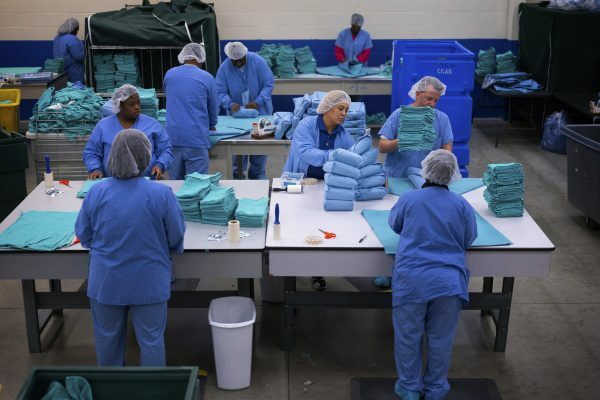 Despite her felony conviction (“Getting a job was my biggest fear,” she says, “having to check that felony box”), Thomas is now a supervisor at the laundry, where she runs a crew that prepares packs of surgical linen for the Cleveland Clinic, the world-renowned hospital nearby. Before you view her story as an anomaly at Evergreen Cooperative Corp. — which in addition to the laundry includes the urban farm Green City Growers and the solar panel and LED firm Evergreen Energy Solutions — note that more than half of the 211 employees at these Cleveland co-ops have been in prison at some point in their lives. In fact, offering job opportunities to Clevelanders like Thomas is why Evergreen exists. “We’re creating pathways into the economy for people who’ve been shut out,” says Jessica Rose, an Evergreen strategy adviser. Launched in 2009 with $5.8 million from a variety of sources — including the city and the Cleveland Foundation, a philanthropic organization dedicated to improving the lives of Clevelanders — Evergreen’s aim is not just to create employment opportunities for people living below the poverty line, but also to offer them a stake in their place of employment, as well as in the communities in which they live. 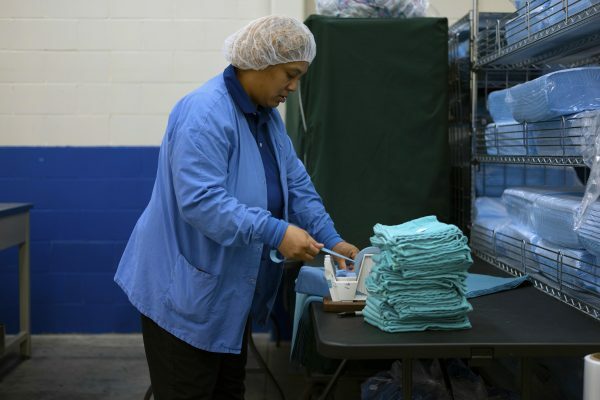 At Evergreen Cooperative Laundry, for example, Thomas is not just an employee. She’s also one of the owners ― she has equity, she gets an annual share of the profit and she has a say in how the business is run. She is also taking part in a home purchasing program in which Evergreen helps its owner-operators secure low-interest mortgages on formerly distressed properties that have been refurbished by the Cleveland Housing Network, a nonprofit that tackles housing challenges for underserved communities. Home ownership in Cleveland can be more affordable than renting as a monthly cost. But for someone like Thomas, who has a prison record and a resulting lack of credit standing, obtaining traditional financing for a home purchase would be impossible. The cooperative’s mission, however, is bigger than just helping its owner-operators, says Brett Jones, Evergreen’s executive vice president. Workers who become shareholders and homeowners are stabilizing their communities. To become an owner-operator at Evergreen, pre-existing co-op members vote prospective members in. Each member has one share and one vote. Those who are voted in (the vast majority of those nominated in the most recent elections) pay $3,000 for their share. The fee is paid through payroll deductions at $0.50 an hour, although members begin to accrue the benefits of being an employee-owner the moment they’re elected. Of the 211 people currently working at Evergreen, 137 are owner-operators. After nine years in existence, Evergreen admits it still has a long way to go — its original goal was 1,000. On Nov. 13, Evergreen launched the Fund for Employee Ownership with the aim of creating 10 new owner-operated businesses in the Cleveland metro area over the next five years with 600 additional owner-operators. With patient capital ― in other words, funding from investors who have no expectation of turning a quick profit ― raised from regional philanthropies, the fund will seek to acquire small- to medium-sized family businesses whose owners are approaching retirement and convert those businesses to the co-op model. “Very few family-owned companies have any succession plan,” says Rose. “It’s typical for there not to be an heir because the kids aren’t interested, which will result in a private equity sale, being acquired by a competitor, or, sadly, the company just closing down. There is strong bipartisan support for expanding employee-ownership opportunities in the U.S., says Nathan Schneider, author of a new book that covers the rising trend of cooperative businesses. He points to congressional passage in August of the Main Street Employee Ownership Act, which encourages lending to small businesses interested in converting to a co-op or an Employee Stock Ownership Plan. While Schneider sees the validity in both those views, he thinks the greater concern should be the opportunity to reshape the economy running our world — one in which the richest 1 percent owns more than half of the world’s wealth. For people like Thomas, the co-op is simply a model that will provide more opportunities for a fresh start, beyond bringing home a paycheck.